ABB's (NYSE:ABB) acquisition of General Electric's (NYSE:GE) electrification solutions business, GE Industrial Solutions (GEIS), in a $2.6 billion deal was one of its biggest events in 2018. The deal was in the works for several months, and investors hoped this acquisition, which also allows ABB to use the GE brand, would boost its electrification products division's prospects. Yet GEIS pulled ABB's margins down in Q3 -- a fact that didn't sit well with investors and sent ABB shares tumbling despite an overall good quarter. 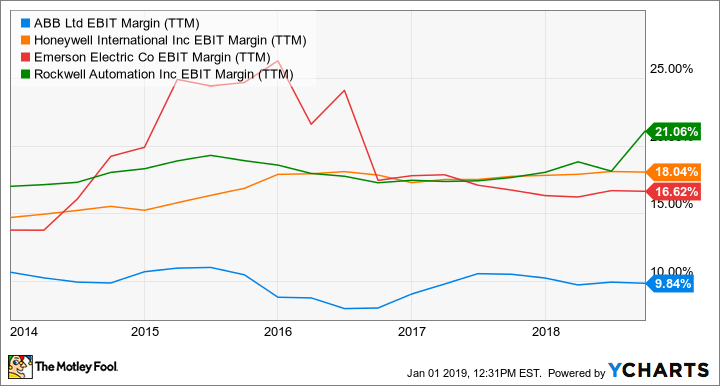 As it is, ABB's margins have hugely lagged those of peers Emerson Electric (NYSE:EMR) and Honeywell International (NYSE:HON), and a margin-dilutive acquisition is the last thing investors want. To rub salt in the wound, industrial stocks witnessed a huge sell-off around the same time. ABB stock finally ended 2018 down 29%. Should ABB's recent announcement of intent to divest its power grids business to longtime partner Hitachi for net cash proceeds of $7.6 billion to $7.8 billion, then, be considered a parting 2018 gift? Should investors bank on management to turn the Swiss company's fortunes and buy the stock today while it trades at a significant discount to Honeywell International and Emerson Electric on a price-to-book value basis? The answer isn't a straight yes. ABB wants to focus more on future trends like robotics. Image source: Getty Images. ABB runs four broad businesses. In order of their contribution to the company's total revenues in 2017, they are electrification products, power grids, robotics and motion, and industrial automation. Through these segments, the company primarily serves the utilities, industrial, transportation, and infrastructure sectors. Power grids has been the slowest to grow: It contributed nearly 28% to ABB's total revenues in 2017 but earned an EBITA (earnings before interest, tax, and amortization) margin of only around 10% in 2016 and 2017 each compared with the 13% to 15.6% range for the other segments. ABB's failure to catch up with Emerson Electric's and Honeywell International's margins, as both companies have greater leverage to the more profitable automation and robotics businesses, even compelled hedge funds like Cevian Capital to call upon ABB to separate power grids. ABB EBIT Margin (TTM) data by YCharts. With ABB now formally selling power grids, hedge funds must be a happier lot. But should investors be? ABB expects to sell its power grids business by the first half of 2020, retaining a 19.9% stake with a defined exit option three years after the closure of the acquisition. ABB's CEO Ulrich Spiesshofer believes this move will "create a new ABB, a leader focused in digital industries" by way of its four new businesses: electrification products, industrial automation, robotics and discrete automation, and motion. Those numbers look encouraging, going by ABB's 2% comparable revenue growth and EBITA margin of 12.5% for the nine months ended Sept. 30, 2018. ABB foresees robotics and discrete automation market to grow the fastest at 6% to 7% annually in the long term. It should really help ABB if it can capitalize on the opportunities, given that robotics and motion was its most profitable business, with an EBITA margin of 15.6% and 15%, respectively, in 2016 and 2017. 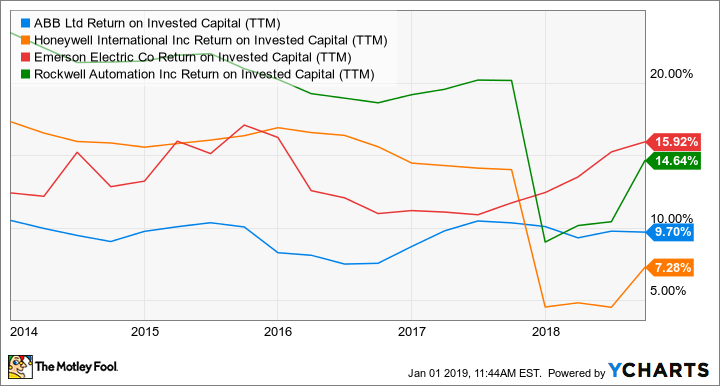 One key metric that I'd watch closely following the sale of power grids is ABB's return on invested capital (ROIC), or the amount of profits it can squeeze out of invested capital. So far, ABB has been a laggard in the industry. Disposing of power grids could dent ABB's earnings in the short term but should, hopefully, boost its ROIC and add value to the company. That should reflect in its stock price as well. ABB Return on Invested Capital (TTM) data by YCharts. Another factor that could drive ABB shares higher is the massive upcoming share repurchase program. In an interesting move, ABB intends to return the entire proceeds from the sale of power grids -- nearly $7.6 billion to $7.8 billion -- to shareholders through share repurchases. That should lower ABB's number of outstanding shares and boost EPS, as EPS is simply a company's net income divided by the number of shares outstanding. Potentially higher dividends -- ABB has increased its dividends every year for 10 consecutive years now -- should further help. That said, the power grids sale and expected buyback are still at least a year away, so ABB needs an improving business environment and better numbers from GEIS to convince investors for now. You might, therefore, want to wait until ABB's next quarterly earnings and outlook release for 2019 before investing, even if for the long term. Check out the latest ABB and GE earnings call transcripts.